Pope Benedict XVI tells us that as much as we may like quick answers, we can gain clarity on the enigmas of life only as we take the time to immerse ourselves in the word of God. So in this article, we want to look at how we can meet Jesus, the living Word of God, in the Bible, which is the written word of God. We want to make three practical recommendations that will help us hear God’s own voice and sense his presence as we ponder his word inScripture. The first step sounds obvious, but it’s one that we can often overlook: Set aside time to read the Scriptures every day. Schedule it in your day. Do it first thing in the morning. Become familiar with the story of the Bible so that you can see how God has worked throughout the ages. Discover for yourself how patiently God has worked, teaching us his ways and preparing us for the coming of the Lord. And don’t be afraid to use reliable commentaries and Bible studies to help you. The more you know about the background, history, and context of the Bible, the better you can piece together its story. But be sure that as you are reading and studying, you are also praying and searching. 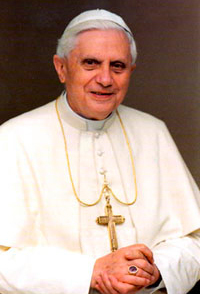 As Pope Benedict emphasized, we can meet Jesus in the words of Scripture. We can develop a deep relationship with him as we let his words sink into our hearts. This doesn’t happen overnight. Like any relationship, it takes time. Think of any close friendship you have. Didn’t you and your friend grow to appreciate each other as you spent time together? Didn’t you become attached to each other as you shared the highs and lows of your lives? You grew to love each other because of the way you shared your hopes and fears, your dreams and disappointments. There is no substitute for time. Relationships take time. Communication takes time. Love takes time. And so we need to be reading Scripture everyday so that we can get to know God. How does he think about things? How does he react to hardship or to good fortune? What makes him happy or sad? What are his dreams and hopes? As you read every day, try to imagine yourself in whatever scene you are reading. When he read the Gospels, St. Ignatius of Loyola would often picture himself as one of Jesus’ disciples so that he could observe closely everything that was going on. He would imagine himself as an extra witness at the Last Supper, drinking in everything around him as Jesus offered the first Eucharist. He would look closely at Jesus’ face as he forgave the woman caught in adultery or as he challenged the Pharisees and Sadducees. He would join Mary Magdalene and the apostle John at Calvary and observe the sights and sounds of the day when Jesus died for him. Inserting ourselves in the Scriptures this way shouldn’t be a passive thing. We shouldn’t just sit back and watch what is happening. We can become part of the scene as well. For instance, as you picture yourself on Mount Horeb with Moses and the burning bush, feel free to ask Moses what it felt like to hear God’s voice. Imagine him turning to you and sharing with you what he was thinking when God told him to confront Pharaoh and demand that he release the Jewish people. You just may be surprised at the answers you get! Be sure not to limit yourself just to the stories in the Bible. Benedict himself encourages us to do the same thing with the psalms, which have been called the Bible’s own prayer book: In the Psalms we find expressed every possible human feeling set master fully in the sight of God. . . . In this way our word to God becomes God’s word. . . and our whole existence becomes a dialogue with the God who speaks and listens. (VD, 24) Imagine yourself as one of the psalmists as you bring your heart before the Lord. And like the psalmists, be bold enough to expect an answer from God. In place of the psalmist’s concerns, insert your own needs and desires, your own longings and hopes. Let his words of praise and thanksgiving become your own. As Benedict said, God’s words will then become your words. His thoughts will become your thoughts. His ways will become your ways, pushing aside anything in you that is opposed to his way of thinking. Slow Down and Listen. “Only in silence can the word of God find a home in us, as it did in Mary, woman of the word and, inseparably, woman of silence.” (VD, 66) Placing yourself in the Bible this way may feel like nothing more than playing make-believe at first. How can you tell if the things you are picturing are coming from your own imagination or from God? The key here is through quiet listening. We live in a very noisy, active world, and all that activity can influence our time with the Scriptures. It can be tempting, as you are placing yourself in a scene from the Bible, to lose sight of your goal and let your imagination run away with you. You may end up spending all your time picturing the scene in detail, imagining the people’s reactions, and letting the story continue to unfold. But all this imaginative activity has to be balanced with silence and stillness. How else will you be able to hear God’s voice? If a particular word or phrase or image catches your attention, stop and dwell on it. Slow down. Take your time. Don’t worry about getting to the end of the story or the end of the psalm. Instead, mull over it. Wait for the Lord to speak to you. It could be as simple as Jesus’ words “Have faith in God” at the Last Supper (John 14:1), or it could be as involved as Paul’s statement that everyone who calls on the name of the Lord will be saved (Romans 10:13). Whatever it is, take time to let it unfold. Repeat the word or phrase over and over again, asking the Lord what he wants to say to you. Write down any impressions you may have. Quiet your heart, breathe deeply, and receive whatever God wants to give you. If the thoughts that come to you fill you with peace, joy, hope, or a desire to be more like Jesus, you can be sure that the Holy Spirit is speaking to you. If the thoughts make you feel anxious, frustrated, or immersed in guilt, then you can be sure they aren’t from God. If the thoughts that come to you move you to act differently, to act more like the Lord, then you can be confident that God is behind them. For instance, you may feel moved to show extra kindness to a friend or family member. You may be compelled to confess a past sin that has been heavy on your conscience. You may find new courage to get involved in a parish ministry. Or you may feel the need to mend a wounded friendship. Whatever you sense God asking you to do, step out and do it. More often than not, you’ll find that one simple step leads to another and another—each one drawing you closer to the Lord. The God Who Speaks. In the introduction to his exhortation, Pope Benedict tells us: There is no greater priority than this: to enable the people of our time once more to encounter God, the God who speaks to us and shares his love so that we might have life in abundance. (VD, 2) With these words, Benedict is telling us that the key to a full, fruitful, and peaceful life lies in hearing God speak his word to us. He is telling us how deeply our heavenly Father wants to open our eyes to his presence and his love. All we have to do is let his word take root in our hearts. Life is full of questions, just as Benedict XVI told us. How good it is to know that we can find the answers as we ask Jesus, God’s full and perfect Word, to speak to us!